Important Note: This is a singleplayer game with no real hope of any co-op or multiplayer being made. You fly around in your small space-pod ship. You can take missions and fly around in a randomly-generated galaxy. You also get to sneak or fight your way through randomly generated ships, each designed to fit in with one of the 4 factions of enemies that are spread around into 4 "areas" of the galaxy. The gameplay itself is best described as SuperHot mixed with Hotline Miami. You can freely pause the game as needed, allowing you a bit of a strategic advantage over your opponents. It lets you aim, look around the area, and even aim the throwing of items (such as melee weapons) from a stopped-time system. This game has no main character. You won't stick with the same character or inventory of items either. As time goes on you will eventually either die or retire your characters, playing as new random ones, with random inventories. Each character has a "personal" mission, which is basically their individual motivation for doing what they're doing. Thanks to these, as well as the variety of items, ships, and galaxies, most experiences are unique. As you play, you will build a "Liberation" meter, similar to levelling up in an Experience Points system. Liberation points are given after completing a mission successfully, and the difficulty of the mission typically determines how much you will get. 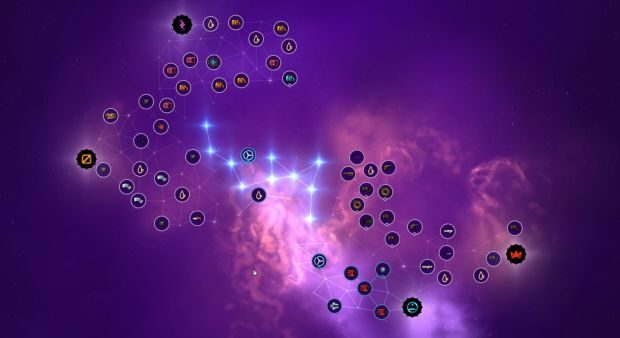 Each time you fill the liberation meter, you can unlock/"Liberate" a new space station, or node, on the star map. Why bother? Well, as you unlock more nodes you gain access to more weapons and items available in the shops at friendly stations, as well as the 4 other types of space pods you can fly (each having their own abilities). A gadget that slows down time for 10 seconds while you speed up. Grenade launchers of various grenade types. Rare Self-recharging items, or less rare restockable items that are replenished at friendly stations for free. Very rare weapons that are OP, such as an acid-firing gun, a shotgun grenade-launcher, and what is essentially the gravity gun from half life 2. Named weapons from previous characters you've retired, or from your friends if you both have Heat Sig on steam. Hacking "beams" that can disrupt stuff through walls. Teleporters that take you somewhere in range, but you'll get sent back in a couple seconds. Breach grenades that destroy whole rooms of a ship. Stealth shields that give you directional-invisibility for a short time. The ability to pickpocket if you're close enough to someone. A Hack "beam" that will not only disrupt certain electronics, but turn them against others. Did I mention you can blow up ships? Each part of a ship is destructible if you have the necessary explosives or shoot the engines in the engine rooms. You can also dock your ship with these opened parts of the ship, but beware, as blowing a big part of the ship tends to set off alarms. We're really in the indie game era, huh. Looks neat. Using 4 remote-detonation breaching grenades, I blow this large Glitcher ship into 4 different pieces. 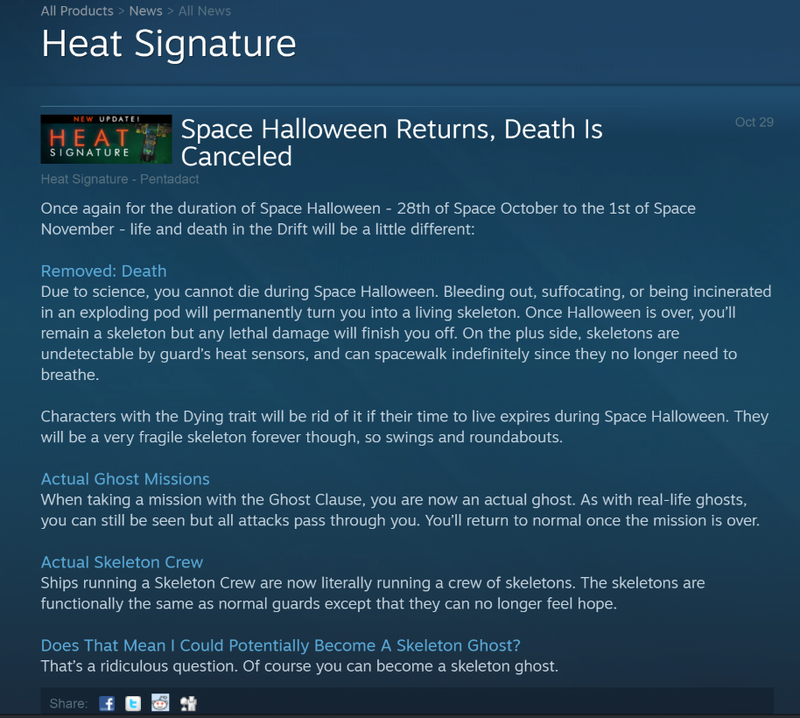 Sometimes in Heat Signature the question wasn't so much "How do I avoid tripping the alarm?" but "How do I get to the captain fast enough that it doesn't matter if I do?" On ships with Autopilot, there is no captain. Tripping an alarm will always trigger the consequence - whether that's a countdown, the target fleeing, or reinforcements. And once it does, there's no way to disable it. Be very careful. Some pilots in the Drift are frankly sick of you flicking on a Shield or a Slipstream and dashing through their ship before they can do anything about it. So they've installed jamming fields in every door on the ship - passing through will crash any active gadget effects you have going on. We can only thank the voidmother that there isn't some terrible new type of enemy that can deploy this jamming technology over a wider area as far as you know. Very rarely, one type of guard aboard a ship will not all have an unpredictable set of equipment. Each guard of this type had just grabbed a random bunch of stuff, so you'll have to bring a versatile loadout and scope out each one as you come to them. Contractors are basically hired hands that patrol some ships. They have 4 possible classes and associated abilities. They're kind of like MiniBosses. A contractor who generates an impenetrable, uncrashable, unhackable shield for all guards near them. The only way to bring these shields down is to take out the Defender who, in one of nature's cruel ironies, only has a conventional shield. A contractor who moves through the ship installing jamming devices that prevent any of your gadgets from working while you're inside their square of effect. The field also scrambles incoming teleportation, so glitching into it is not advised. The jammers can be destroyed up close if you can get to them. Crashing a Jammer prevents them from placing any more jamming devices. Subverting them... does something else. A contractor with specialized sensors that track your exact location on the ship at any range. They will hunt you relentlessly, their reactions are instantaneous, and their high velocity rifle is virtually impossible to dodge. Watch for the red tracks leading to you. Crashing a Tracker disables their sensors, subverting scrambles them. The most lethal contractors in the galaxy. Step into their pulsing sensor range and they will instantly detect you, teleport to you, and kill you in the same move. Shields don't help, their blade is already in you when they glitch. Good luck. Crashing a Predator disables their sensor and teleporter. Subverting them... does something else. There's a lot more to do, so I figured I would bump this thread.